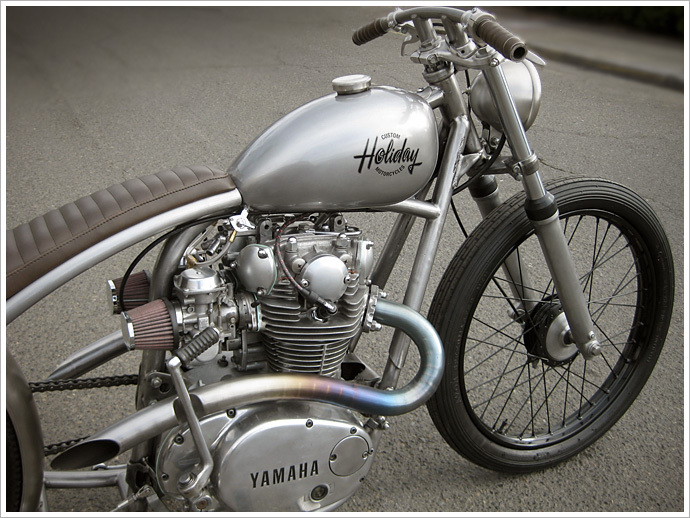 Jared Johnson from Holiday Customs has certainly got his own distinctive look going on. 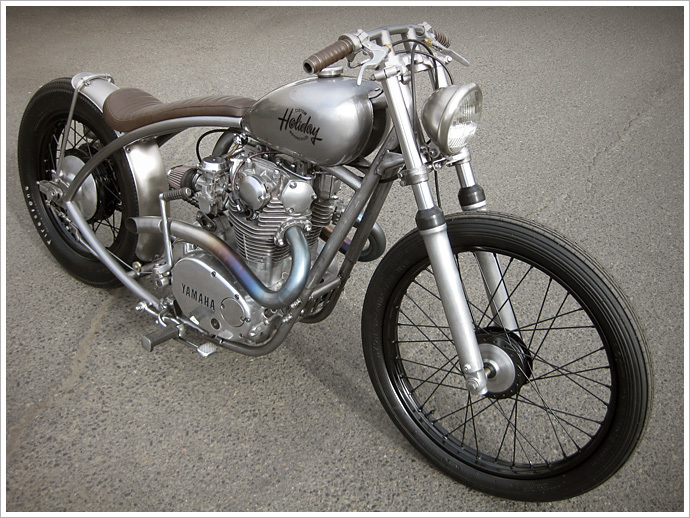 This is the third generation of his curved, Schwinn inspired XS650. 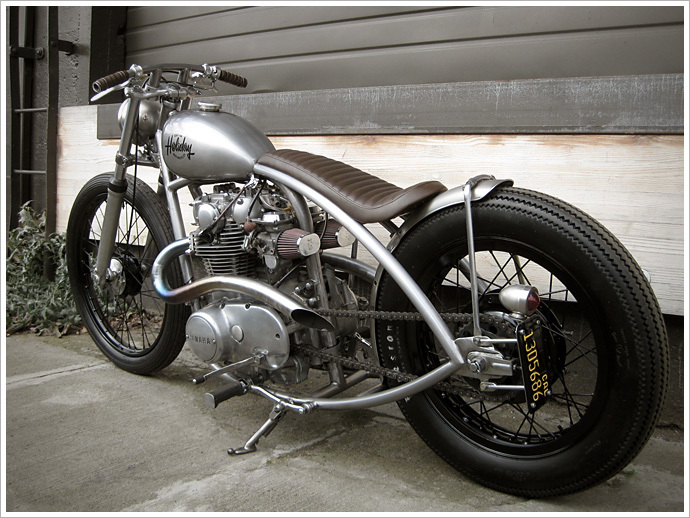 The first one he kept for himself, the second one was sold to Alex Turner from the Arctic Monkeys, and the third, which we are featuring today was recently built for The One Motorcycle Show. 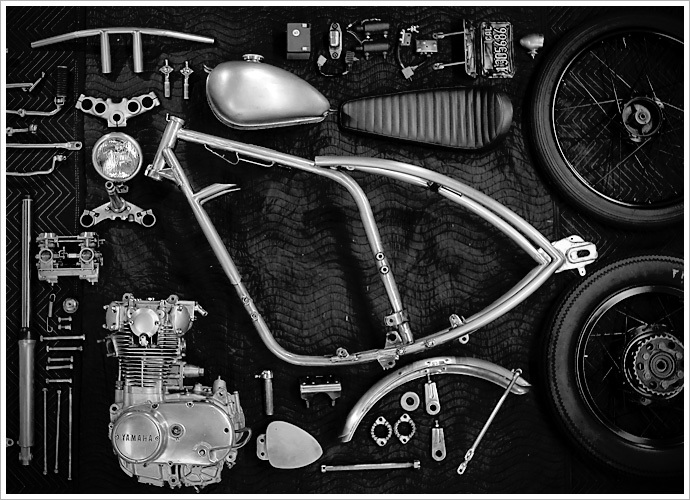 The first one took around three months to build, the second took two months and the third he was able to complete in one month, due to the pressure of finishing it in time for The One Motorcycle Show. Jared picked up the donor XS650 in his home town of Portland. “It wasn’t much” he says. “Just an engine and frame, but I had everything else around the shop.” So with only a month to have it finished, he got wrenching. 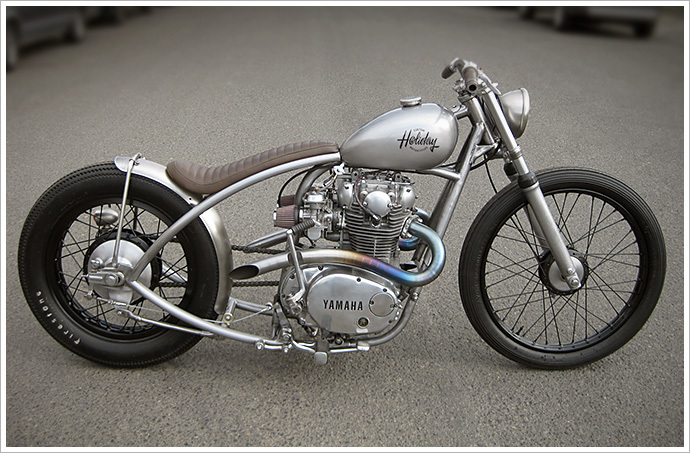 The bike is titled as a 1983 Yamaha XS650 but the engine is from a 78″. The engine was in great shape but Jared rebuilt the top end – as he always does. The rear wheel is a stock 18″ while the front is a 21″ from Honda dirt bike . As usual, the bespoke brown seat was made by Ginger at New Church Moto – who is conveniently located next door to the Holiday Customs garage. The rear brake is also one of Jared’s favorites, the aircraft cable running under a pulley which was designed around a problem area. Instead of trying to match grips to the seat color, this time Jared decided to use the left over fabric from the seat to match it perfectly. Jared enjoyed the excitement and the pressure of having the One Show deadline looming over his head. He also found himself watching biker build off shows whenever he had any free time. “It kinda motivated me to pull long hours and get it done.” Jared was still working on the bike at 11pm the night before the show, but luckily finished in time to get a good nights sleep – his last for the next few days of partying at the show. “I left the show with a trophy and a big grin on my face”. It doesn’t get much better than that. 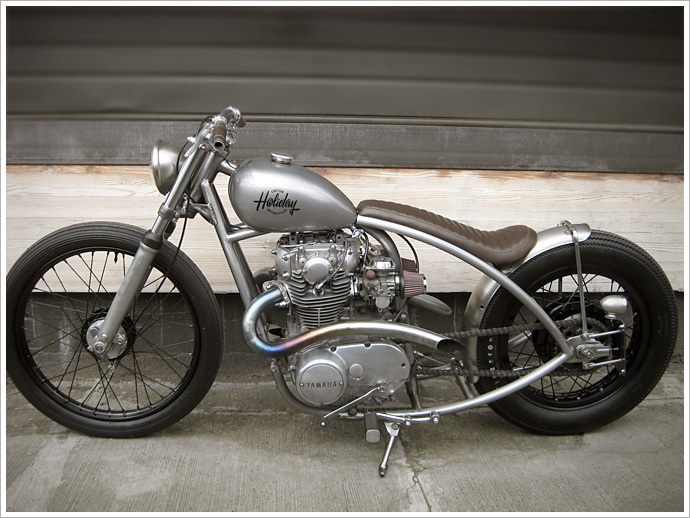 If you like what you see, the bike is currently for sale at Holiday Customs. Also, if you haven’t seen this video featuring Jared in his element, hit the jump now.